A question I get asked a lot by non blogging friends is “Why do you Blog?”. In truth I think everyone collects memories and records their life in different ways. You might write a diary, take photos, have a memory box, scrap book or you may share your life updates to Facebook, Twitter and/or Instagram which is a form of micro blogging. In the pre internet days (remember them?) I always wrote a diary. I still have a couple of diaries from my junior school days. I also used to keep scrapbooks and have lots (possibly too many) of memory boxes stored away in our attic (and indeed even mum’s attic- sorry mum). In the days of MySpace, most of my friends and I all kept a Livejournal (another blast from the past). I genuinely miss those days of freely writing about what I was up to and how I was feeling and I loved reading my friends everyday thoughts and keeping up to date with what they were up to in a way that you can never grasp from the micro blogging social media sites. When people began to drift away from Livejournal I looked for another outlet for my ramblings. After a brief tumble with Tumblr I began a new free blog on Blogger (Blogspot) as this was where I found most of the blogs that I loved to read. I began to write regularly on this and when Danny went for his third heart operation I hoped to share updates with our friends and family on this site. This wasn’t to be the case as the hospital internet room blocked Blogger from their network and this was in the days before phones were up to the job and wifi was accessible freely. We returned home from hospital but I never returned to that blog and over time my login and password were erased from my memory. At this time I was still busy working as a teacher and a mum of three. After a redundancy and a brief change of career I went on to have my fourth child, Isabelle. While breastfeeding I used to read blogs, sew and knit (not all at the same time) as she, like the other two girls, seemed to feed constantly. So when she was two months old, in February 2012 I set up Diary of the Evans-Crittens again on Blogger. You can read my first post here. I loved writing at this time. I was busy running around after four under eight year olds and blogging was the one thing I could do for myself at the end of a stressful day. Now, it is so special to go back and read those memories and realise how much things have changed. It’s amazing to see the kids grow up through blog posts but even geographically, the field we used to walk across every day has gone, the kids schools have closed and shops I mention- Woolworths and Bettabuys are no more. Perhaps one day my blog will even be of interest to local social historians, who knows? I carried on like this happily blogging our everyday. Then I began to get emails from brands asking if they could send me products. I have to admit as a then one income family with four kids and no maternity leave I was delighted to be sent some “free” products- it was so exciting! One of the first products I reviewed was sun cream for Isabelle. I also began to get emails offering me money to write about certain brands or to place adverts on my blog. I remember remarking to Dave that it was strange and I deleted them thinking they were spam. One of my blog posts caught the eye of a fellow blogger and she began to tweet me. I remember her telling me about Tots100. She said it was a great way to meet other bloggers. So I signed up and indeed met a huge community of online bloggers, many of whom I have now had the opportunity to meet in real life and become good friends with. Through Tots100 I also discovered how you can legitimately earn a living from you blog and they began to send opportunities my way too. I found myself setting up as a self employed freelancer, earning money from writing this blog and for other sites. I admit, sometimes it reminds me of Anne of Green Gables in Anne of the Island when she earns money from writing a story to advertise baking powder. Overall though I feel so grateful that I have this opportunity to earn money from home while bringing up my family and to continue writing this blog. I do wish that I had more spare time and could write out even more of our memories but even though not everything get’s encapsulated in a blog post as I look back year over year so many of our memories do and it’s lovely to reread them. After asking me why I blog, some friends go on to say that they want to start a blog and I encourage them. I love to read blogs so if all my friend’s wrote blogs my world would be an even happier place. Some people worry that they have nothing interesting to write about but you’d be surprised how interesting other people would find your life just because it’s different to theirs. All our lives are diverse so it’s fascinating to read about they way others live. You don’t even have to write about your life per se – you could write about one particular hobby or interest. In fact niche blogs are very popular, especially when others with an interest in that area begin to find you. The other worry that people have is time. That’s something that I can’t help you with as I struggle to find time too. We all have the same amount of minutes in the day but it’s up to us how we spend them. I’m forever “moaning” that I can’t find the time to run but of course I could make time. As I mentioned earlier I can fit blogging with bringing up the kids but sometimes that means I only start work at 11pm or past midnight. I have even been known to pull an all nighter during the school holidays when I’ve had a work deadline. I often see people complain that they can’t sleep at night. I’m busy until very late (or very early depending on how you look at it) so I’m dropping tired by the time I get to bed. It’s worth it though to know that I can go to concerts, school events, sports day and even activities with the kids at school (today I’m doing samba drums with Caitlyn). It’s your life and you have to do what works for you. If you want to start a hobby blog then you should start with a free site. Personally I would recommend Blogger , where I started. It’s completely free and very easy to use. If you need help I found Geekalicious a really useful website for technical help on blogger. However, if you think that your blog may eventually develop into a business then you could start on a free WordPress plan which will make it easier for you when you decide to go self hosted. Basically, when you’re just starting out, don’t spend any money, there’s no need for a hobby blog. Even when I realised my blog was a serious business I was reluctant to leave blogger- it was my blogging comfort blanket. I knew I needed my blog to look more professional though. So I paid to have a custom domain on blogger. This changed my url from www.evans-crittens.blogspot.com to www.evans-crittens.com (another thing to admit here is I don’t love my blog name. I wish I’d used something more abstract but changing names and rebranding would mean starting back up again so for now I’m happy to keep this). Once I was making money from my blog, I was happy to invest into it. I bought a new template from Pipdig (currently available from £39). Their templates are gorgeous and work so well. They also install everything for you and offer support whenever needed. I still use Pipdig on my current WordPress site. As a birthday treat for my blog I also paid for a blog header from Ellie Illustrates. I love this header but it does need updating and modernising. I’m currently working with Laura from Cardboard Cities to design a new collage header but it’s taking me ages to choose the “right photos”( I’m such a procrastinator-sorry Laura!). As I mentioned earlier I needed to make the move from Blogger to WordPress Self Hosted. My blog is my career and yet up until last year Google owned it and could have taken it offline at any time. The catalyst for me eventually making this leap was taking part in Emma Drew’s Create Your Wildly Profitable Blog in 5 Days Course. Even as an established blogger it was beneficial for me to to go through this course to see what steps I’d missed along they way in my blogging career and to see if there was a way for me to work smarter (spoiler alert: there was). Emma Drew, through this course and the closed Facebook group that members have access to, held my hand as I walked through the scary self hosting process and for that I will always be grateful. I continue to be a member of Emma Drew’s My Blog My Business Group and am consistently finding ways to improve my work practice and make more money (thanks Emma). As a teacher I loved learning at INSET days and as a blogger online courses and conferences are equally valuable. After a lot of research I chose Siteground to host my blog as I heard good things about them from everyone. Pipdig also offer a great deal if you migrate with them which is what I chose to do (I took advantage of their Black Friday sale last year). If you are serious about blogging and want to go self hosted Siteground are currently offering new members 3 months free on their starter package. My blog was “down” last month for the first time ever and Siteground straight away sorted it for me which was a huge relief as I admit I hate the technical side of blogging- just leave me to the the pretty photos and words and I’m happy! Blogging is constantly evolving in many ways. It’s important to keep up to date with the legal and technical side of it. I am always looking out for online courses to learn from. As a hobby blogger look out for free courses- there are lots available. I would recommend starting with Emma Drew’s free courses. But you many want to go on to buy books and courses to further your learning. There is a great offer at the moment (only for the next few days until Monday 15th October!) on the Genius Bloggers Toolkit. This is a fantastic way to make a one off payment and get a bundle of courses and resources which you can work through over the year. 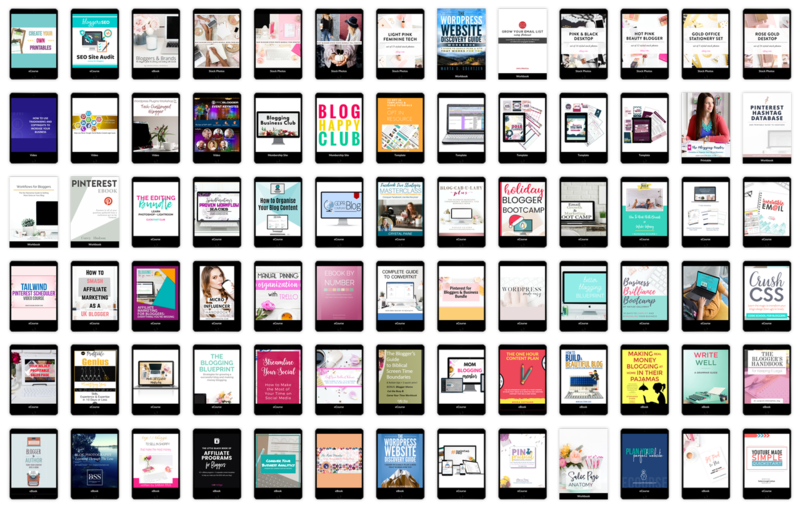 … all curated to give you a comprehensive blogging education that will grow with you as you hit each blogging milestone. It costs $97 (approximately £75) but if you were to buy each resource individually it would have an incredible value of $5,867.88. What’s Included and Do I need It? 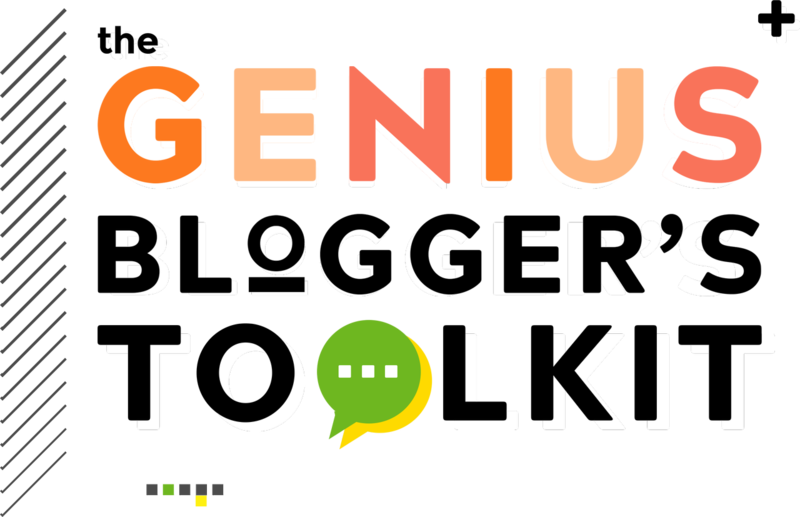 The Genius Blogger’s Toolkit contains over 77 resources so the chances are you’re not going to need them all. Before you do decide to spend any money take a look at the contents and decide if any of the courses are for you. Click here to read a full list of The Genius Blogger’s Toolkit. One course that I have taken and can recommend is Emma Drew’s House to Smash Affiliate Marketing as a UK Blogger. I had already signed up to lots of affiliate schemes before joining this course but i was yet to make any money from them. Since doing the course I can class Affiliate Marketing as one of my monthly streams of passive income (something I hope to increase each month). Two courses that sold the bundle for me this year are “A Micro Influencer Handbook” by Chelsea Clarke ($250.00) and “How To Work With Brands (& Make Money)” by Jessica Festa ($249.00). For me these justify the price of the bundle (full disclosure as an affiliate I received my bundle at a discount. You can sign up to become an Ultimate Bundles Affiliate here to benefit in this way too.). I haven’t worked through these particular courses yet so I can’t give you my honest review or tell you if I’ve learnt anything new from them but I can say I’m looking forward to working through them. An added bonus this year is the option to purchase Cheat Sheets with the Genius Blogger’s Toolkit. This allows you to benefit from the courses a lot more quickly. I’m sure I’ll dip into these a lot throughout the year. Another way to learn about blogging is to attend conferences. Tots100 occasionally run free Blog Camps but for most conferences there will be a fee. I found these so beneficial during my first few years of blogging. Then it felt like a lot of repetition. However I went to Flea Enterprises Blog Retreat last year and learnt so much while having an amazing time so it’s all about finding the best conference for you. In summary, everyone can blog and it doesn’t need to cost you a penny. 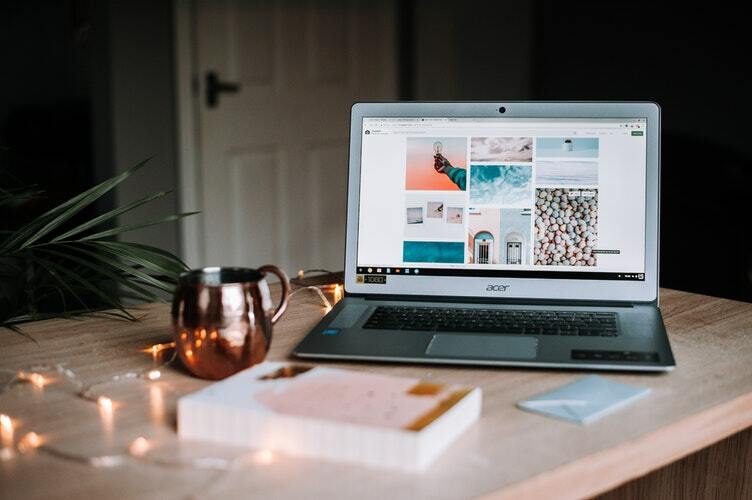 But if you do want to class your blog as a business then over time there will be some compulsory as well as some optional outlays if they are for you. Do you write a blog? Would you like to write a blog? What would you blog about? Let me know in the comments! Bloggers love a new notebook (well this blogger certainly does), for your chance to win a Busy B To Do Note Book enter the Rafflecopter below (remember to read the terms and conditions)- good luck! Next Post GLOSSYBOX Advent Calendar 2018: What’s Cruelty Free and Vegan? I don’t have a blog but keep thinking about starting one up. I’m arts and love my arts and crafts so I would blog about my ideas and creations and try to inspire people! Fantastic guide 🙂 It has something for everyone whether you’re new to blogging or been at it for a while. I’ve been blogging for a long time; I started back when the internet was young in my teens and blogs were a hobby rather than a big well known thing like they are now. My current blog, Just Geeking By, existed for a few years as a personal blog before it got an overhaul into it’s current incarnation 2 and 1/2 years ago. I would like to blog about endangered British plants, birds and animals. I would love to run a spa blog, my fave pasttime & I have plenty to say on it too! I would blog about being a Granny if I started one! Definitely music as I love all sorts. But some bands I like are rather odd or people haven’t heard of them before. I don’t have a blog, but lately I have been thinking about setting up a book blog, as I love reading. I don’t have my own blog but i do write book reviews on NetGalley. If i had my own blog it would be on books and crafts. I have thought about blogging & have even got my domain but not sure whether to make my blog specific or to have a varied one about things I like. I would love to blog about life with my girls. The real ups and downs. I would like to blog about my childminding business. I don’t have a blog but if I did it would be a lifestyle blog! I have a couple of lifestyle and money blogs – it’s hard work so I appreciate your post as it reminds me why I do it!